Ok. Here it is. The photo we've all been waiting for. 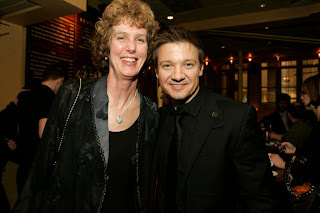 Jeremy Renner and yours truly pre-awards ceremony Saturday night at the Casablanca restaurant in Harvard Square. I read somewhere that women of a certain age should tilt their heads up toward the light so their necks look better. Don't do this. Though my neck looks almost fetching, my jowls look like they're filled with a winters worth of food. And my eyebrows don't look too happy either. 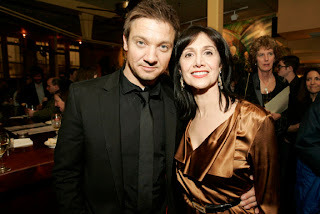 Renner looks as perturbed about this as I do. Either that, or he hadn't had his scotch yet. In any case, we actually had a lovely chat, and apparently he went out and partied all night. I, on the other hand, am re-contemplating several surgical procedures. Or not. Jocelyn Wildenstein haunts me forever. But at least you know I was actually there with the Oscar nominee, and not making this stuff up. The other photo features Jeremy Renner with Julia Child's niece--Philadelphia Cousins, accepting the Best Actress award on behalf of Meryl Streep! "Phila"--rhymes with "dial a"--was absolutely delightful and engaging in the way that Julia was--and clearly they're swimming in the same gene pool.